NEW BRITAIN - A Massachusetts-based nonprofit serving girls and young women who have lost their mothers will host a launch party tonight to celebrate its new empowerHER Connecticut chapter. “This celebration is just the beginning of our journey and underscores our unwavering commitment to building and supporting the empowerHER community in Connecticut to serve young girls who may need a reminder of their own strength,” said Connecticut empowerHER ambassador Laurie Faye. The event will be held from 6:30 to 9:30 p.m. at the Back Nine Tavern at Stanley Golf Course. Guests can enjoy “lite bites” and a cash bar and hear from speakers including empowerHER founder Cara Belvin, award-winning broadcaster Candy O’Terry, and a few girls enrolled in the program. The mentor match program matches girls and women 5 to 24 years old with a mentor who can relate to the loss of a mother and who can provide support and resources for the girl throughout the year. The nonprofit also offers a series of events for girls to connect with other girls who can relate to their loss. Themes have included a beach bash, cooking classes, and a Mother’s Day retreat where girls spend their time connecting and honoring their mothers with activities, dinner and a sleep over. All programs and activities are offered at no charge to the family. The organization is funded entirely by private donations and business sponsors. State-based sponsors include Eversource and The Hartford. Belvin, a Southington native who was 9 when she lost her mother to breast cancer, formed the organization out of gratitude for the support her family had received. “It started five years ago and it grew like wildfire,” she said. Until now, the organization has only operated in Massachusetts It now has 400 volunteers there, serving over 150 girls. 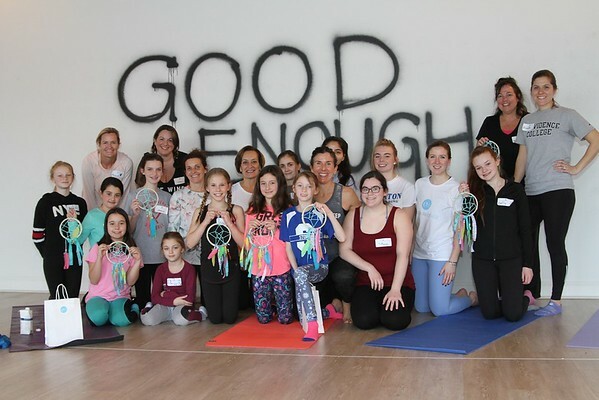 The newly formed Connecticut chapter has 12 girls enrolled. “I think after Thursday night we’ll have more girls,” said Belvin. Belvin said all the girls in Connecticut are invited to join any event in Massachusetts until Connecticut builds its own series of events. The organization is looking for mentors across Connecticut. To volunteer, visit www.empoweringher.org/mentor-match . To enroll a girl, visit www.empoweringher.org/enroll-a-girl . Michelle France can be reached at 860-801-5087 or mfrance@centralctcommunications.com. Posted in New Britain Herald, New Britain on Wednesday, 3 April 2019 20:25. Updated: Wednesday, 3 April 2019 20:28.